This Scottish metrical psalm has only really became well known in the mid-twentieth century, largely by reason of its inclusion in the Queen’s wedding service. Scholars have claimed that at least seven authors are represented in this version, though the final tidying up for inclusion in the 1650 publication was by Francis Rous. It has a universality that allows it to be used at both weddings and funerals, where its peaceful pastoral imagery and its assurance of God’s presence with us through death and in eternity give much comfort. The tune carries that same sense of blessing. Its composer was a poet, mystical writer and spiritual healer. He knew many changes of belief in his life and it was as the result of one such return to faith that he wrote a number of poems and melodies. In 1915, in the middle of the First World War, he published a book: The great peace: being a New Year’s greeting to our motherland and the nations at present in conflict and a welcome to them all to the feast of the great peace, composed by your brother and comrade in the good fight of brotherhood. He organized a Brotherhood of Healers to treat sickness, both mental and physical, and would often sing to patients as part of their treatment. 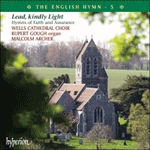 The present arrangement of the tune was made by Malcolm Archer for the Choristers of Bristol Cathedral.